First off, I admit, I am a die-hard Jeffrey Archer fan. I read all the 17 novels he has written. So, doubts about objectivity and trustworthiness of this book review, if you have any, are definitely reasonable and well-founded. You might say my thinking is clouded. And, you are within your rights to stop reading. But hear me out. And then decide. 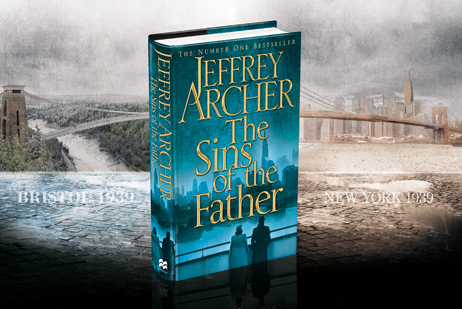 “Sins of the Father’ begins with Harry Clifton’s ship docking at the New York Sea Port, around 1941, soon after Britain declares war on Germany in WW II. He had been crossing the Atlantic, from Bristol in UK. The motive was to escape to the land of liberty, and avoid marrying Emma Barrington, because he simply cannot marry her due to a deep dark family secret. The last I had seen Harry was in the last chapter of Only TimeWill Tell, when he was aboard the American ship USS Kansas Star. He was among the few rescued when the British ship he was originally travelling in from Bristol, was hit by a torpedo from a German U- boat. Harry Clifton then assumes the identity of a fellow passenger rescued along with him, Tom Bradshaw, who dies on the route to New York. On landing, Harry is promptly arrested by New York police. And he realizes, too late, the great dangers of taking on the identity of a man whom he hardly knew. Why does Harry change his identity? Well, you must read the first book to know the reasons. 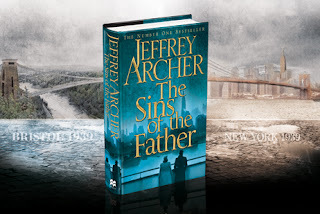 Both the books, Only Time Will Tell and The Sins of the Father, are the first and the second from the five Clifton Chronicles that Jeffery Archer had promised readers a couple of years ago. Here is his facebook note to readers. You will see readers' comments too. And like me, I am sure, many other readers must be hoping he won’t be finished before he finishes the five books. I wonder what’s in the mind of the master story teller, for the next three books. Anyway, let’s come back to this book. Emma Barrington is in UK, when Harry is arrested in USA. She is, by then, with an unborn child from Harry Clifton, who is unaware of it. She wonders where he disappeared – and starts investigating. Giles Barrington, brother of Emma, and best friend of Harry Clifton, is also shocked at the disappearance – but has to join the war. Massie Clifton, mother of Harry receives a letter from someone, but is unable to understand why such a wonderful son, whom she struggled hard to raise up, has gone off suddenly into the dark. These are not spoilers. You wont lose anything from knowing the above. but reading the first book is essential. The novel is written in different parts during the WW II years (1941-1945 mainly). From the perspectives of Harry Clifton, Giles Barrington, Emma Barrington and Massie Clifton; all being key characters in the story. Though not Chronologically perfect - considering the overlaps of narratives of the same accounts at different times by different people - it makes very enjoyable reading. It is a definite page-turner gathering momentum to reach a climax that almost made me gasp, when it ended. And I am eagerly waiting for the third novel in the series, and what it might bring. We see that in all his novels, the protagonists are all usually exceptionally bright. Their spouses or partners are exceptionally loyal to them, and vice versa. They are all true-blue British who join the war ‘to shoot a few Germans’. We see in almost all his writings, a generous sprinkling of historical tidbits, contemporary to the times in which the plots are set. We also see the some wonderful secret well-wishers of protagonists. You will see them in this book too. But isn't that what we all love to read? The human touch in extraordinary tales? My main regret is that I will forget some finer details in this book by the time I read his next book which may take an year from now to be published. I enjoyed it. I am sure you would too. But read the earlier book first. And follow it up with this. Joel’s verdict? Four Stars out of five. Here's the trailer of the Book.